So the first Seven Colors of Spring workshop drew to a close this evening. 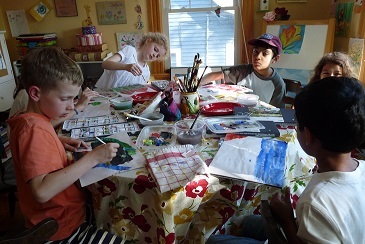 June’s workshop opens next week and several of the young artists in May’s workshop will continue next month–yay! I will keep with me many moments from this workshop, but mostly I love that each and every one threw herself into her art with passion and vigor. 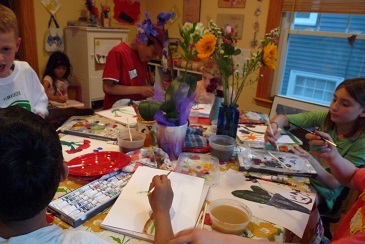 Even the one not-so-sure artist from the start consented to extend himself more fully into his art, using blending techniques and choosing complementary colors today on his Matisse collage. The youngest in the group showed an astounding facility with pure color. Each week we focused on one or two new artists and learned a few new techniques with acrylics or oil pastels. Copying a Monet waterlily painting with oil pastels and an Impressionist Van Gogh landscape proved to be especially popular. This week’s focus on Matisse and Klimt also yielded some exquisite and imaginative collages and dazzling Adeles in ball gowns of various glowing colors with various symbolic creatures and patterns imprinted. Some pics from the first day, finally, and I’ll set up the Gallery shortly, with many more examples of the truly extravagant and amazing work that this workshop elicited. Thank you, all, in this very special first group, for helping create this first, most, vast, everything workshop! I wish you all Much Art always, and hope you will Paint Forever! 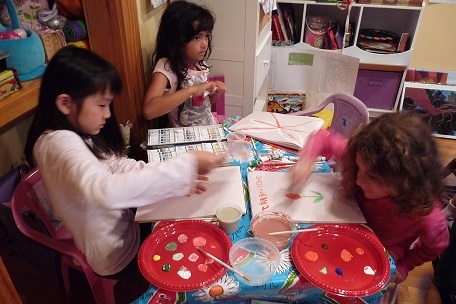 Ramola, thank you so much for this wonderful idea – I know the kids liked it a lot! You are filling in a gap, and this is such a nice contrast to the all-existing soccer-etc-classes. We can’t wait to continue.